One adult size will fit forearm circumference up to 20"
PneuGel Universal Tennis Elbow by Sroufe. Elbow aching? Try the Universal Tennis Elbow for instant relief. 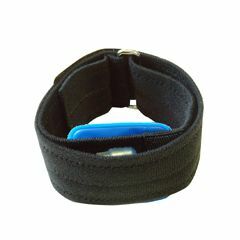 This elbow wrap comes with two gel packs for applying pressure to inflamed tendons. The bladders may be placed in the freezer and used for "cold therapy" to reduce swelling. This wrap will fit either a left of right forearm of 9" to 20" in circumference. Made For Larger Arms. Sturdy. Lightweight. This Tennis elbow brace is the best one yet. It is made to fit larger arms. Being a bigger person I found this one to be very comfortable with enough length to fit comfortably. Nothing like those cheap ones you buy at your pharmacy. Love the removable gel packs. I put one in the freezer and it feels great wearing it with the cooling effect. If you have larger arms get this one today! You'll love it! will this work for heat therapy?